It’s Sunday afternoon, November 3rd and I have just returned from a very pleasant walk up the Rannerdale valley and back via Buttermere. 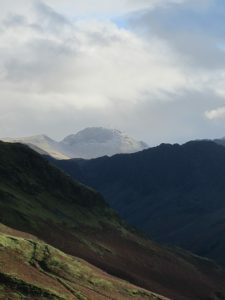 As I came over Rannerdale col, I saw the first snow of the season on the tops of Gable and Kirkfell. 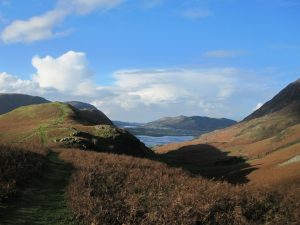 In the other direction it was clear, bright sunshine and I could see both Crummock and Loweswater and of course Foulsyke! I am now generally relaxing a little as I had my annual Tourist Board inspection last week. I had a new inspector, (always a bit worrying), but he was very impressed by the Cottages and thought they were excellent and I maintain my Five Star status with Gold Accolade in all the cottages. My son, Paul, and I spent some time updating the website when I was visiting him last month. We have added an ‘Out and About’ tab which includes a cycling page by Paul which looks at both on and off road cycling, ranging from family friendly to very challenging! 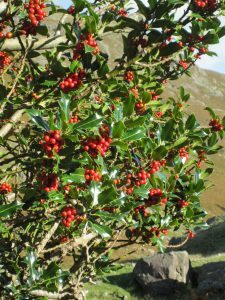 I eventually managed to put together a walks page of mainly local walks, but it was very difficult to know what to include as there is such a choice of walking! While I was out and about the other week by St Johns in the Vale, I saw a house name that made me smile – KU HUS – you need to say it out loud to get it! On the same walk, I saw my first flock of fieldfares, there’s something really quite special about seeing them arrive in the Autumn. Judy and I had an excellent walk a couple of weeks ago, the weather was bright and sunny so we decided to do Tarn Crag via Easedale and Codale tarns. On a couple of previous occasions we had hit bad weather there and promised ourselves to walk it on a clear day! After picnicking in the sunshine on the top of Tarn Crag we came down to Far Easedale (not necessarily our intention) and had a beautiful valley walk back to Grasmere.